Cambodia’s ancient Khmer Empire, The founder of the world’s earliest public health system? via BBC World Service, 29 October 2018: Peter Sharrock from SOAS discusses the ancient Khmer hospital system. Jayavarman 7th, arguably the most ambitious of Khmer kings, was a great builder: he ordered the construction of many large temples and other public monuments, and also over a hundred hospitals. Art historian Dr. Peter Sharrock from the University of London explains how the hospitals were staffed, supplied and why everyone could use them. Source: BBC World Service – The Forum, Cambodia’s ancient Khmer Empire, The founder of the world’s earliest public health system? via BBC Sounds, 28 October 2018: A BBC audio program about Angkor and the Khmer civilisation featuring a number of prominent scholars. I am a little bothered by the fact that there aren’t any Cambodians in the panel though – it seems silly to have a discussion about Khmer culture and civilisation without any Khmers involved. Around the twelfth and thirteenth century CE Angkor was thought to be one of the world’s biggest cities. Its massive temple complex at Angkor Wat covered hundreds of acres adorned with majestic towers, terraces and waterways: symbols of the might of the Khmer kings who ruled the region. Angkor Wat attracts millions of tourists every year and has pride of place on the Cambodian national flag but there’s much more to Angkor and the Khmer civilisation than its temples. Last week, Apple announced a revamped iBooks and iTunes U service aimed at bringing textbooks and course materials to the iPad. There’s a fair buzz in the education circles, but how much content is there relating to the archaeology of Southeast Asia? Maritime trade between China and the rest of the world (often passing through Southeast Asia) has been around for nearly 2,000 years, but it has only been in the recent past that China has built up the capability to undertake archaeological investigations underwater. The BBC World Service has a podcast on China’s Forgotten Admiral – Admiral Zheng He, who in the 1400s travelled from China to Africa, making stops through Southeast Asia. Radio Australia publishes an interview with Thai (and Cambodian?) archaeologists about the ongoing dispute over the Preah Vihear temple. The podcast is also available for download. 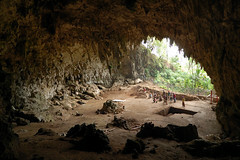 Archaeologist Jiao Tianlong is exploring the origins of the Austronesian people, who spread their language and technology from Southeast China and Taiwan to the rest of Southeast Asia and the Pacific Islands some 6,000 years ago. 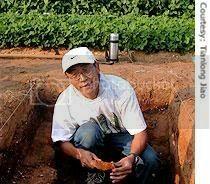 8 May 2007 (Radio Singapore International) – RSI’s series Discovering Singapore, features an interview with Singaporean archaeologist Lim Chen Sian, about what archaeologists do, and what’s there to find in Singapore. Would you believe that beneath the concrete jungles of cosmopolitan Singapore, we can find white sand dating back to the republic’s early days of Sang Nila Utama? Or even the discovery of forts that probably existed during the British colonial era? Just some of the unusual discoveries by Singapore’s rare breed of archaeologists like Lim Chen Sian. With their trusty digging tools, these archaeologists attempt to uncover more behind Singapore’s rich historical past. But what does an archaeologist in Singapore really do? And are there really that many treasures to dig up in the republic? Read and listen to the interview here.